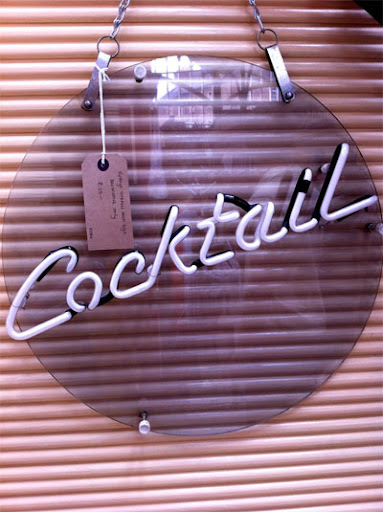 Neon cocktail sign, £25, All Mod Cons. "Neon is ace, its on my wish list of things to own when I find the 'forever' home. I’d love something like this in my dream kitchen." 1930s tea and coffee set with sugar bowl and milk jug, £15, Garbo Antiques. 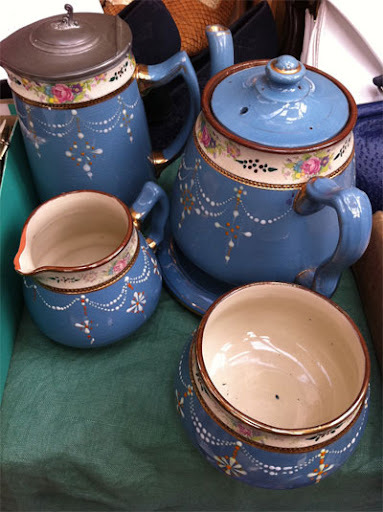 "This was a real find and had my funds allowed I would have snapped this up, the teapot even has its own stand. Really delicate decoration and in great condition for its age. I hope this went to a good home. This was a fantastic stall with a large amount of stock at really reasonable prices too! Looking forward to having a good root through next month." 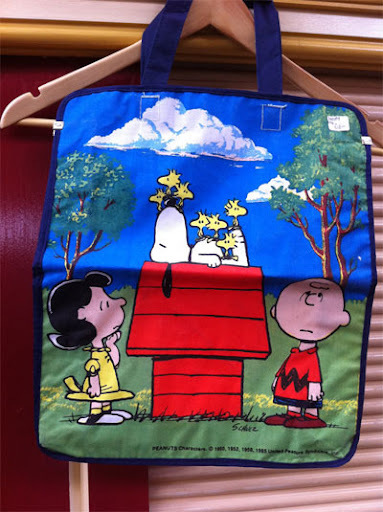 Snoopy book bag, £10, TC Design. "Another sentimental pick here, readers. Snoopy was one of my favourite cartoons as a child and I even had a Snoopy and Woodstock teddy combo that was dearly loved." 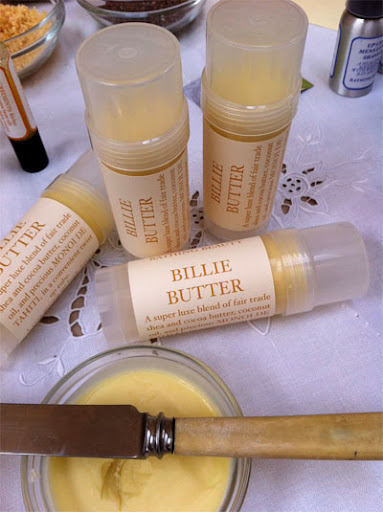 Billie Butter limited edition, £12.50, Bathing Beauty. "A twist up tube of amazingly scented body butter - very womanly layered smell. I thought it was like a cross between Chanel no 5 and Chanel no 19, sounds weird but totally worked. Key ingredient is Mono de Tahiti and its named after Billie Holiday as she always wore gardenias in her hair (another ingredient)." 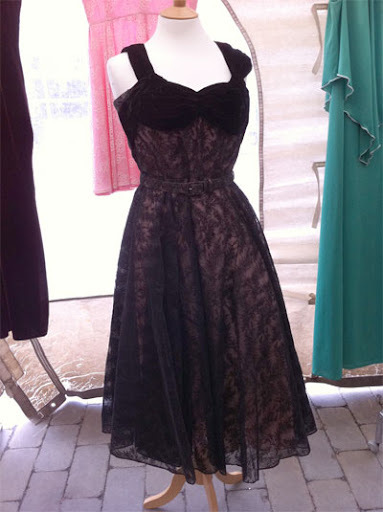 1950s circle evening dress, £80, Village Vintage Clothing. "Could see Betty Draper from Mad Men in this! I’ve taken two pictures to really show the detail and the lace overlay. In fantastic condition but only a size 8-10, I’m sure this would have been snapped up quickly though!" We're so thrilled with July's Finder! She is a regular visitor to The Vintage Village and has blogged about us (and her own personal finds) a fair few times already, and this month she kindly agreed to take on our Finds of the Fair mission. This is quite a coup for us! Old Fashioned Susie is a stay at home mum and Housewife of the non-Desperate variety; blogging about shopping with a retro twist, vintage furniture and clothes, beauty, baking... sometimes even parenting! Old Fashioned Susie believes in manners, chivalry and buys quality over quantity. She’s also trying her hand at developing vintage nights-out and events in Manchester and surrounding areas as she loves a good cocktail every now and again! In previous lives Susie has been a high school teacher, makeup artist, boutique assistant and artist. Visit Old Fashioned Susie's website, and you can follow her on Twitter and Facebook too. UPDATE: check out Susie's new Vintage Manchester website, which is developing into the essential resource for news about vintage shopping, events and fairs in the Greater Manchester area. 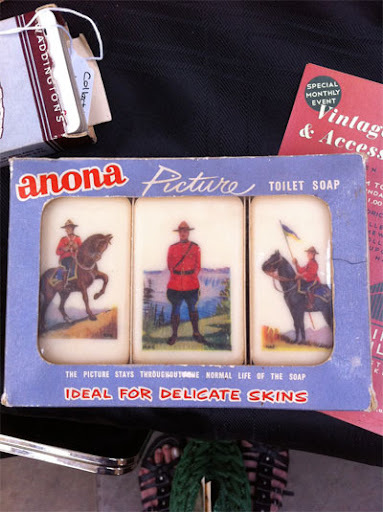 Canadian Mountie Soaps 'for delicate skins'!, £3, Rachel’s Boutique. "These caught my eye as they reminded me of that TV programme from the mid 1990s Due South, and the fact that I had a teen crush on the Mountie in it - I think his name was Paul Gross (clearly I didn’t think so!)" 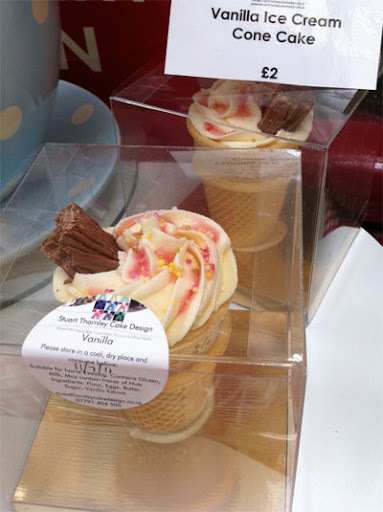 Vanilla ice cream cone cake, £2, Stuart Thornley Cake Design. "A genius idea of baking a sponge cake inside an ice cream cone then topping it off with ice cream flavoured icing and a Cadburys Flake!" 1970s pocket watch, £18, Revision Vintage. 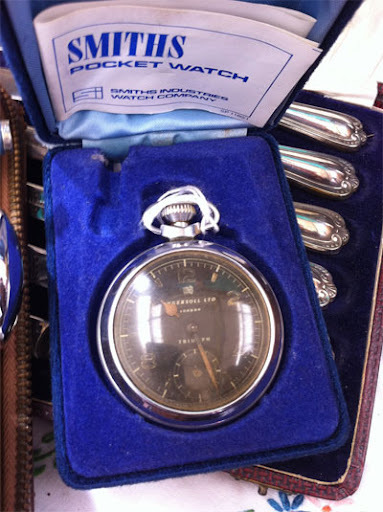 "I’ve not seen many pocket watches at The Vintage Village before so this jumped out at me. I love pocket watches on men, they are so much more elegant and I love the fact that you don’t need a battery, you just have to make sure you wind them up every day. Needless to say Mr Old Fashioned has two!" 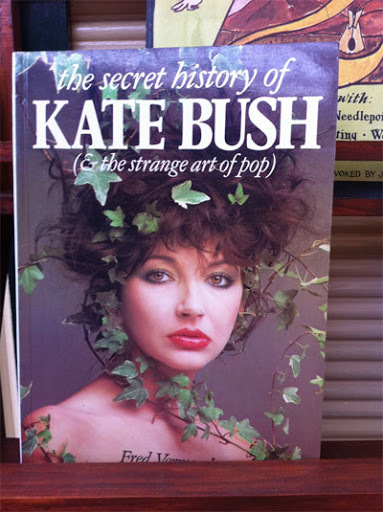 Kate Bush book, £3, Eclecta Books. "Kate Bush - who everyone loves, whether its Wuthering Heights or you fancy the pants off her in the Babushka video. I love the front cover of this book - and in no way is it playing up the 'mad as a sack of badgers' image!"